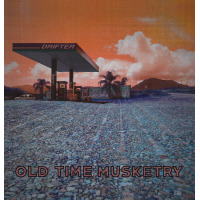 Brooklyn-based Old Time Musketry is a band whose moniker foreshadows one aspect of the sound it's after, steeped in folk music and Americana. But the quartet's debut, Different Times, contains so much more. First and foremost, Old Time Musketry is a jazz quartet. Sure there's quite a bit of accordion and clarinet on this recording, but these guys are jazz guys. Mostly. The title track, with its rhapsodic tenor and piano melody sprawling over pattering free-ish rhythms, evokes memories of '70s-era pianist Keith Jarrett and his quartet with saxophonist Dewey Redman. On "Underwater Volcano," saxophonist Adam Schneit's tenor rides a headlong rush of crisp drums and funky Wurlitzer piano like a crazy surfer. Different Times' most memorable tune, "Parade," marries a truly jaunty lead line to a chugging second line rhythm. Here, pianist JP Schlegelmilch's rapier sharp solo invokes Monk, Don Pullen and Jarrett without imitating. The CD's two ballads"Hope for Something More" and "Floating Vision"have a yearning sort of sound and loping rhythms that lapse into a slow-rock feel. "Hope for Something More" has an especially lovely, almost stark, melody that's echoed by Schlegelmich's oddball keys, with Schneit's understated clarinet drifting over the rhythm section like a lonely bird. The rootsy, Americana side of the bandif it could even be called thatcomes to the fore on the album's remaining tracks. It's not a straight-up, Ken Burns style of Americana; instead, Old Time Musketry deals in the odd, the difficult, and the spooky. Musical kindred spirits include artists such as guitarist Bill Frisell, percussionist John Hollenbeck, and clarinetist Andy Biskinall of whom have constructed complex, multihued musical worlds that embrace the entirety of American music. Composer Charles Ives and pianist Cecil Taylor. Pianist Duke Ellington and singer Woody Guthrie. The one thing these pieces have in common is the extensive use of clarinet and accordion, instrumentation that really lends itself to a sort of "otherness" that associates itself with old-time music as well as Eastern European ethnic music. It's practically archetypal. "Star Insignia," with its plodding rhythm and accordion drone, seems an odd choice for an opening track, but the tune builds and grows dramatically, providing a fine example of Old Time Musketry's stellar song-craft. Before veering off into some fairly abstract territory, "Cadets" features a strong melody and really interesting changes that recall some of Hollenbeck's work with Claudia Quintet. "Anger Dance" and "Highly Questionable" both seem to draw some inspiration from Klezmer and Eastern European music without being purely ethnographic explorations. As its title implies, "Anger Dance" gets pretty aggressive, tottering on the edge of free jazz before going off in an entirely different direction. Really, that's what Old Time Musketry seems to be about: confounding expectations; not just going to unexpected places, but finding something unexpected in places that might be seem all too familiar. 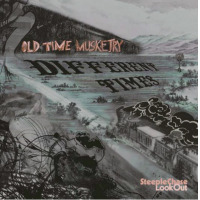 Different Times is a beautifully realized snapshot of a fully matured band with massive compositional and instrumental chops, and, most importantly, some very interesting ideas. Track Listing: Star Insignia; Parade; Different Times; Cadets; Hope For Something More; Anger Dance; Hightly Questionable; Underwater Volcano; Floating Vision. Personnel: Adam Schneit: saxophones, clarinet; J. P. Schlegelmilch: piano, Wurlitzer, accordion, glockenspiel, synthesizer; Phil Rowan: bass; Max Goldman: drums, melodica.